Somewhere around 6000 B.C., Neolithic herdsmen in Central Asia discovered that the milk they stored in bags made of animal stomachs reacted with the enzymes from the skins, causing the milk to curdle. But it tasted good. And just like that, yogurt, rich in nutrients and high in protein, was born. Eight thousand-plus years later, the recipe is essentially the same. 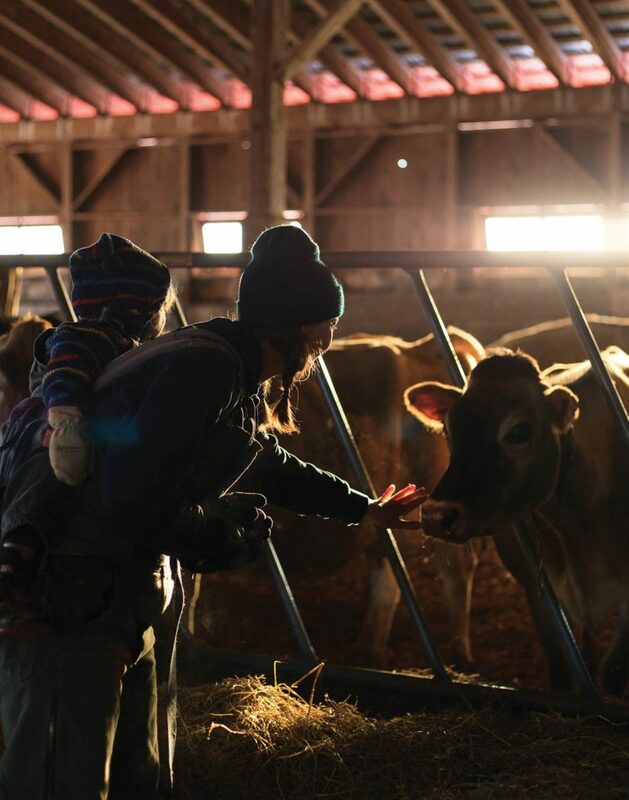 “Just two ingredients, milk and live active cultures,” says Maine yogurt producer Caitlin Frame of The Milkhouse, an organic creamery in Monmouth. But yogurt has evolved in a myriad of ways. In Maine, consumer interest in local products, combined with dairy farmers innovating with new value-added products as their agricultural sector struggles, has given birth to a boomlet of new yogurt makers. They’re flavoring it with Maine-made maple syrup. They’re straining it into thick, creamy Greek yogurt and mixing it with wild Maine blueberries. Any health food store or cooperative in the state worth its salt seems to have at least three Maine-made yogurts on its refrigerated shelves. And in the case of Frame and her partner, Andy Smith, their farmstead product is finding bigger markets. Last summer Milkhouse started supplying Hannaford, making Milkhouse a major success story in a time of dwindling returns for most dairy farmers. 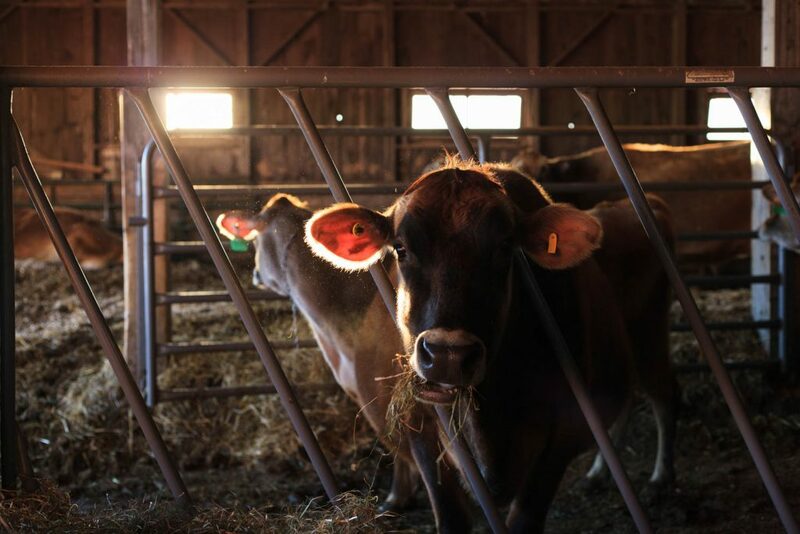 Since 2000, Maine has lost more than half its dairy farms, dropping from 483 that year to a current level of 235, the bulk of which produce and ship milk to Maine’s four major fluid processors in Portland, Westbrook and Houlton. At least 13 of those farms produce milk and process and sell it directly to consumers, including The Milkhouse. Milk prices continue to fall and it has become harder for smaller farms in more far flung corners of the state to find haulers willing to pick their milk. Adding to the pressure, says Julie-Marie Bickford, executive director of the Maine Dairy Industry Association, is consolidation of processing and retailing at the national level. Maine farmers have three choices in how they respond, Bickford says, try to gain efficiencies, exit the industry or diversifying. Experimenting with value-added products is one way of diversifying. 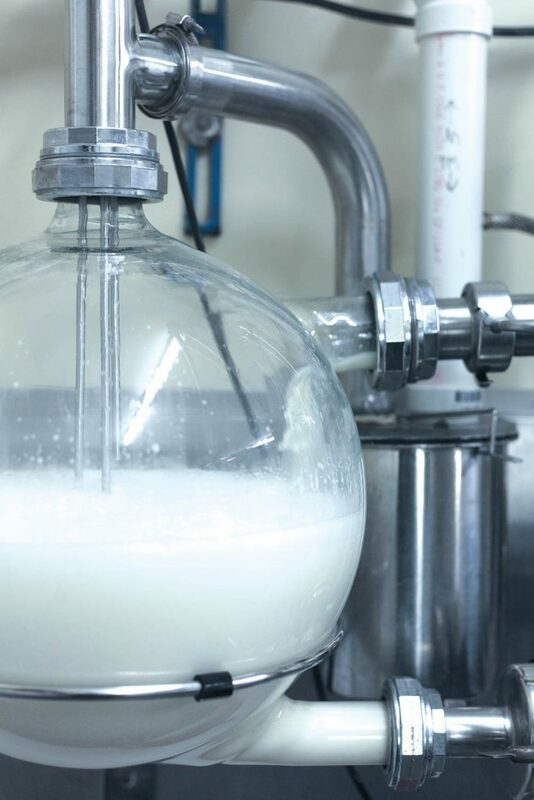 According to Bickford, Maine has over 150 licensed milk processors who make value-added products, from ice cream to buttermilk, cheese to butter. And yogurt. The Milkhouse lost its wholesale organic milk contract with Horizon right around the time it gained one with Hannaford to sell yogurt. Making yogurt is not a solution for all by any means (with 71 million gallons of milk produced in Maine in 2018, that would be a lot of yogurt) but for some it is a bright spot. Or as Jacki Perkins, Organic Dairy Specialist for the Maine Organic Farmers and Gardeners Association (MOFGA), puts it, a “logical choice,” particularly for small farms looking to take advantage of consumer passion for farm-to-table foods. Yogurt to the rescue. It’s relatively fast and easy to make. For such a simple product, the health benefits read like a nutritionist’s dream. Yogurt can boost the immune system, maintain blood pressure and calm an irritable bowel. It’s said to help sick bodies heal and doctors recommend it to anyone coming off antibiotics, to rebalance the gut. Because it is rich in calcium, yogurt strengthens teeth and bones as well as helping to prevent osteoporosis. Yogurt has even been shown to increase longevity, in this case not just in those who eat it, but for the farms that make it. At Hannaford markets throughout the state, The Milkhouse whole milk yogurt, including flavors such as maple and blueberry sit next to nationally known brands and costs almost the same as several of them (with a deposit for the bottle). The Milkhouse is the only local, farmstead yogurt Hannaford carries in Maine (in Vermont, Hannaford stocks Butterworks, a local Vermont yogurt) according to Hannaford’s manager of external communications, Erika Dodge. But maybe not for long. “We are seeing increased consumer interest in products like The Milkhouse yogurt, and are always exploring opportunities to work with more local producers,” Dodge says. Many dairy farmers grow up on a family farm but Frame, despite her success, has been in this business less than a decade. Her first experience with working the land came from gardening with her family growing up in Rochester, New York, her basic skills gleaned from working alongside both of her grandmothers’ extensive flower and vegetable gardens. She went on to start a garden of her own when she was in middle school and worked it with her mother. 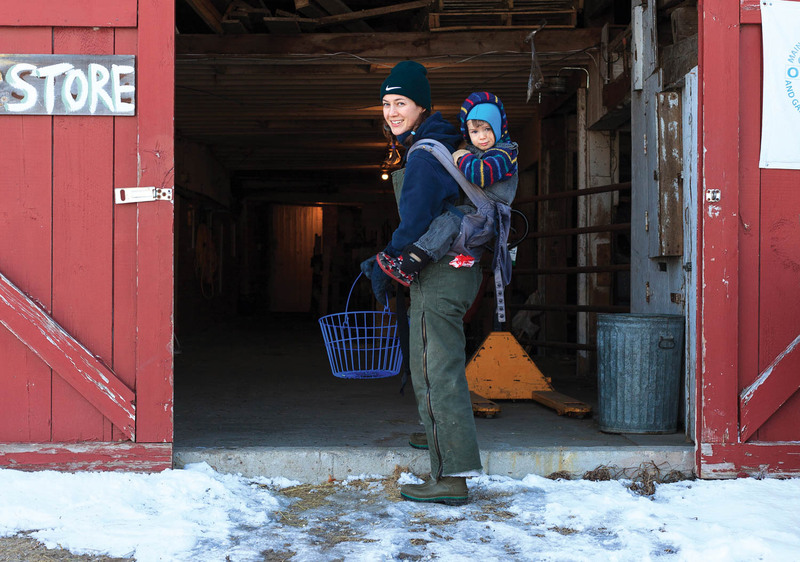 In 2010 Frame moved to central Maine to work on a small vegetable farm where her enthusiasm was tempered by the vicissitudes of everyday farm life and the grinding work of market gardening. The realities of a life committed to farming were beginning to take hold. Her relationship with Andy Smith, who she met through mutual friends, was in its early stages. He was working on a diversified farm in Freedom. Among the animals he tended at the farm, Smith became particularly close to an ornery cow named Lucy and her calf Lupe. They taught Andy the ins and outs of working with bovines, including the fact that each cow has her own distinct personality. In 2012 the couple moved to Two Loons Farm in South China, an organic dairy run by Paige Tyson and Spencer Aitel. Both are first generation farmers in their 60s, with plenty of received wisdom to pass onto Frame and Smith. They gave the younger couple the go-ahead to reanimate the farm’s old milk room. After months of clearing, cleaning, painting and plumbing, Frame and Smith got their state dairy license. The Milkroom started selling yogurt to their first accounts in January of 2013. Not long after, they began looking for a farm of their own, where they could continue with the yogurt business, but also milk their own cows. In 2015 they made the move to Monmouth. Three years later, with the Hannaford account secured, their yogurt became the most widely distributed Maine-made artisanal yogurt in the state. Frame believes that the core magic lies in what kind of milk is used. The couple, who live on the farm with their young son Linus, milk Jerseys. Frame calls them “fairytale cows” for their relatively small size and their cartoonishly large, soulful eyes. 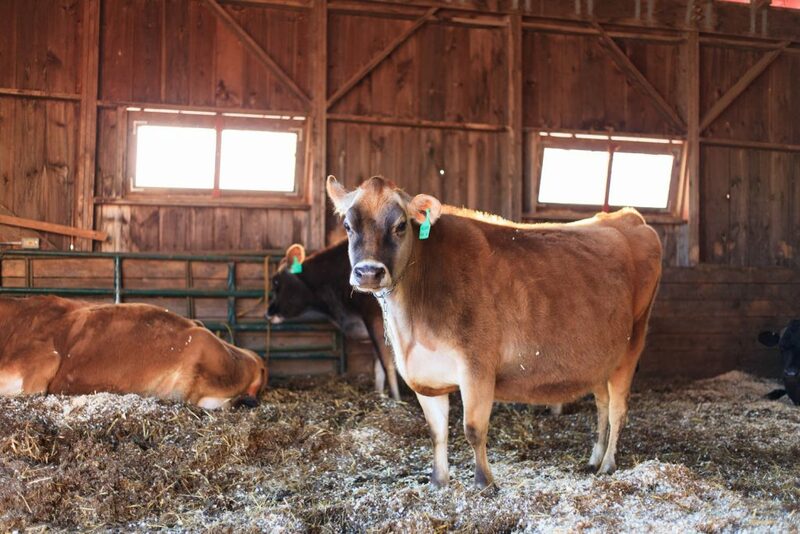 Jerseys have high component milk, meaning it is rich in fat and protein, much more so than milk from their larger sisters, the Holsteins. “Fat is flavor, ” she explains. But it’s not just the breed that matters. “Different levels of quality and taste depend on an individual’s style of management and farming,” Frame says. Traditional Yogurt has a light, creamy consistency and a mild taste. It typically takes about one cup of raw milk to get one cup of traditional yogurt. Greek Yogurt has a tangier taste and thicker texture. It also has more than twice the protein of traditional yogurt. It takes about 4 cups of raw milk to make one cup of Greek yogurt. Icelandic Yogurt or Skyr similar in texture to Greek yogurt and has a similar nutrition profile—high in protein, but it is thicker and slightly less tangy. Kefir is often sold as a beverage and has a much thinner consistency than traditional or Greek yogurt. It retains that distinct yogurt tang and is slightly effervescent. Kefir has more than three times the probiotic cultures than yogurt. Non-Dairy Yogurt whether made with soy, almonds, coconuts, or cashew, non-dairy yogurt incorporates the same cultures that go into dairy yogurts. They have a similar nutritional profile to dairy yogurt, but have the added benefit of fiber. Candace Karu is a writer and passionate home cook who lives and works in a tiny apartment on Portland’s West End. Her life partners are three ill-behaved, exceedingly small dogs, who make up in attitude what they lack in size. When she’s not working, you can find Candace in the kitchen, at the gym, or on Maine’s roads and trails, running and photographing all the way home.